S.T. Dupont Habanera Collection is one of the most exclusive and sought-after S.T. Dupont limited editions. It is made up of six Line 2 pocket lighters, one for each of the most famous brands of Cuban cigars: Punch, Hoyo de Monterrey, Cuaba, Romeo y Julieta, Trinidad and Vegas Robaina. Each lighter is decorated with the most precious Chinese lacquer and depicted with the symbols typical of each brand. Only 300 individually numbered pieces for each line were produced in the far 1999 (very rare!!). All the lighters come with a double flame cigar burner. 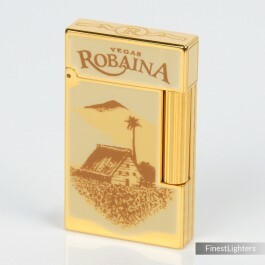 This is the "Vegas Robaina" Line 2 lighter, finished in gold and white Chinese lacquer. For more information about "Habanera Collection" Limited Edition click here.